MACCLESFIELD, N.C. -- The driver of a school bus that overturned with 19 children on board will face charges, authorities in North Carolina said. Julianne Bridgers, 40, of Pinetops, is charged with careless and reckless driving, State Highway Patrol spokesman Sgt. Mike Baker said. Bridgers told officers she swerved Friday to avoid a deer that ran in front of the bus, the patrol said. 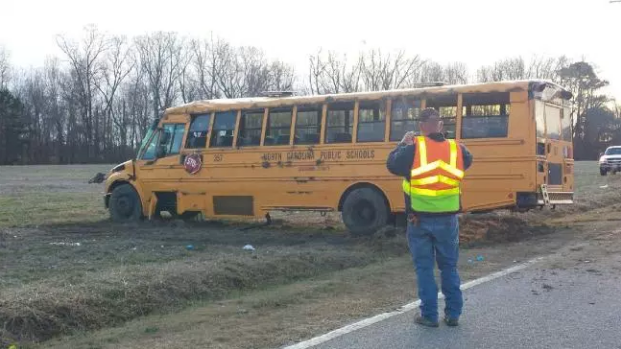 The accident happened at 7:10 a.m. Susan Hoke with Edgecombe County Public Schools said 19 kids were on board, CBS Greenville affiliate WNCT reported. Hoke said the bus was heading to G.W. Carver Elementary School in Pinetops, a town in eastern North Carolina, when it rolled over. Several were transported to area hospitals. According to Hoke, none of the injures were life-threatening. Edgecombe County Sheriff James Knight said 15 students in total were injured, WITN reported.